With the integrated printing and cutting technology of TrueVIS at your fingertips, you can print and automatically contour cut dynamic decals, signs and vehicle graphics, plus brilliant banners, amazing apparel and more. 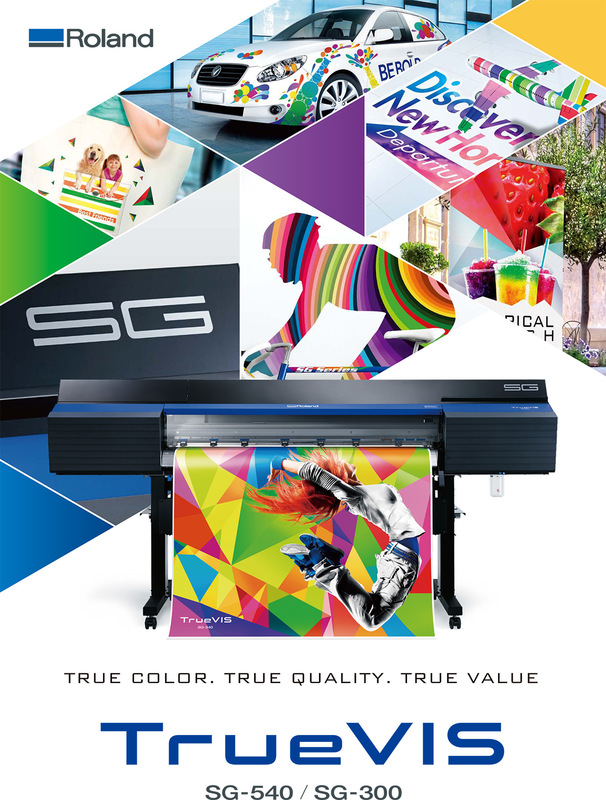 New FlexFire print heads deliver vibrant color and razor-sharp image output that cannot be matched by latex or other devices. Added productivity – up to 60% faster than previous comparable models – means you can print more, and profit more. Part of Roland DG’s next generation TrueVIS family, the SG series is available in 54-inch (SG-540) and 30-inch (SG-300) models, with a host of advanced features and an attractive price point. TrueVIS SG printer/cutters come with two new FlexFire print heads for high efficiency and quality, new cutting technology for increased accuracy and downforce, a Bluetooth-enabled mobile control panel, and 4-color ink options in brilliant TrueVIS INK. Part of Roland DG’s next generation TrueVIS family, the SG series is available in 54-inch (SG-540) and 30-inch (SG-300) models, with a host of advanced features and an attractive price point. TrueVIS SG printer/cutters come with two new FlexFire print heads for high efficiency and quality, new cutting technology for increased accuracy and downforce, a Bluetooth-enabled mobile control panel, and brilliant 4-color TrueVIS INK.